Michelle Encarnación ’15, also know by her stage name “Mishelle Encarnación,” came to Ramapo College with the dream of becoming a professional singer and recording artist. 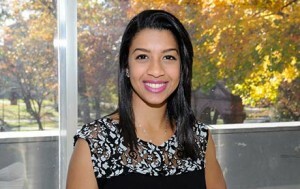 In her first semester as an exchange student from the University of Puerto Rico, Michelle found the opportunity she was looking for through her vocal training with Professor Lutter. In 2014, Michelle began working on her first solo album under the guidance of Professor Richard Sorce and Barbara Norris. Michelle’s singing can be heard on the newly released album, “A Place I’ve Never Been,” as she performs, “Where You Are” along with Bobby Deitch and Amarildo Costa (Ramapo College Faculty). Several tracks from The Richard Sorce Project are being aired on NPR and PJR (Pure Jazz Radio and Metromedia) and the full album is available on CDbaby.com. Michelle graduated from Ramapo with a degree in Music Performance and a minor in International Business.